This 72 foot granite tower was built in 1905 on a narrow ledge of rocks that threatened the entrance to Portland Harbor. 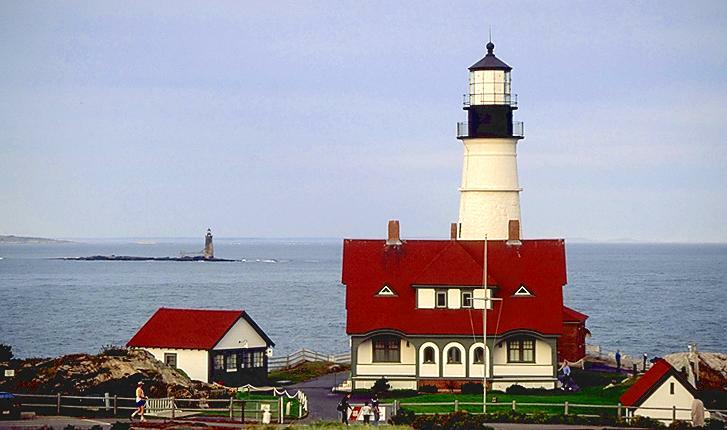 It is nearly a twin of the Graves Light in Boston Harbor, which was built around the same time. A total of 699 4-ton granite blocks were cut from the quarry in Vinalhaven and carefully shaped and numbered before being shipped to Ram Island. Construction was hampered because the ledge is only above water for a few hours each day. Ram Island Ledge can be easily seen from Portland Head Light. Originally fitted with a third-order fresnel, the light now shines through a 300mm plastic optic, powered by a long underwater cable from Portland Head.